Even favored prisoners rarely got good furniture (see the note below). Still here, as always, Linguet seems to find something just a bit more extreme in his own situation. The articles of furniture are worthy of the light by which they are exhibited, and the apartments they serve to decorate. I must first observe, that the Governor contracts with the Ministry to supply them; and this is one of the trifling perquisites attached to his immense revenue, which I shall take notice of presently. He may frame excuses for himself, with regard to the inconveniences of the prison, because he cannot change the situation of places; he may palliate the niggardly distribution of wood; under the pretext of saving the King’s money; but on the head of furniture, which is entirely his own affair, and for which he is paid, he can have neither excuse nor palliation: his parsimony in this particular is at the same time both cruel and dishonest! Two mattrasses half eaten by the worms, a matted elbow chair, the bottom of which was kept together by pack-thread, a tottering table, a water pitcher, two pots of Dutch ware, one of which served to drink out of, and two flagstones to support the fire, composed the inventory of mineBST. I was indebted only to the commiseration of the turnkey, after several months confinement, for a pair of tongs and a fireshovel. 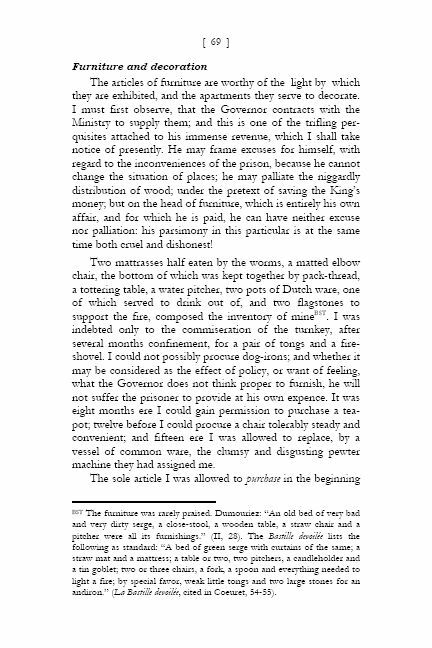 I could not possibly procure dog-irons; and whether it may be considered as the effect of policy, or want of feeling, what the Governor does not think proper to furnish, he will not suffer the prisoner to provide at his own expence. It was eight months ere I could gain permission to purchase a teapot; twelve before I could procure a chair tolerably steady and convenient; and fifteen ere I was allowed to replace, by a vessel of common ware, the clumsy and disgusting pewter machine they had assigned me. 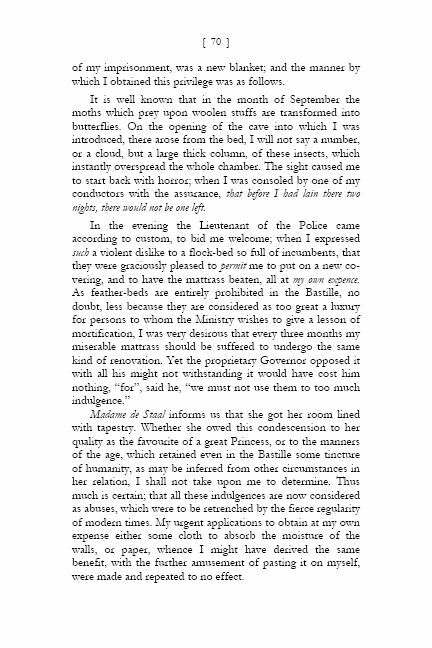 The sole article I was allowed to purchase in the beginning of my imprisonment, was a new blanket; and the manner by which I obtained this privilege was as follows. It is well known that in the month of September the moths which prey upon woolen stuffs are transformed into butterflies. On the opening of the cave into which I was introduced, there arose from the bed, I will not say a number, or a cloud, but a large thick column, of these insects, which instantly overspread the whole chamber. The sight caused me to start back with horror; when I was consoled by one of my conductors with the assurance, that before I had lain there two nights, there would not be one left. BST The furniture was rarely praised. Dumouriez: “An old bed of very bad and very dirty serge, a close-stool, a wooden table, a straw chair and a pitcher were all its furnishings.” (II, 28). The Bastille devoilée lists the following as standard: “A bed of green serge with curtains of the same; a straw mat and a mattress; a table or two, two pitchers, a candleholder and a tin goblet; two or three chairs, a fork, a spoon and everything needed to light a fire; by special favor, weak little tongs and two large stones for an andiron.” (La Bastille devoilée, cited in Coeuret, 54-55).